Today, blended families wedding vows are becoming more necessary as more families are mixed due to death or divorce of one of the parents. 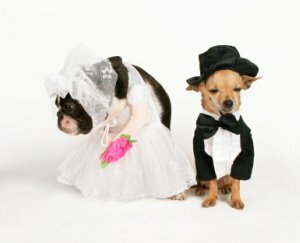 You would choose your ceremony from putting together any of the 11 parts or by using any of the ready-made ceremonies. When it comes time for the ring vow exchange though, different wording could be used, if there are children involved. The goal is to make them feel included and important in the joining together of two separate families. My own mother died at an early age and my father remarried twice. The first time I had a stepmother of the iconic kind, but thankfully my dad realized the mistake he made and divorced after 12 years. He then married again, this time to a wonderful woman who I called my stepmama. I now prefer the term bonus mom, dad, son or daughter. There's a website about it called www.bonusfamilies.com if you'd like more information. You may use that term in the wording of your vows if you so desire. Here are some examples of what you can use in blended families wedding vows. ________, do you promise to be the very best parent that you can be to ______ (name(s) of child/children), to love ______, honor and cherish him/her/them? To be their (his/her) best friend and do your very best to be there for them/him/her when they need you? Answer: I do. I promise you in love. If you would like, you can have a small gift or gifts to give to the child/children at this time. They can open it there or wait until after the ceremony to do it. Bonus child/children: ______, do you promise to love, honor and cherish _______ (bonus parent), to be their best friend, to cooperate with _______ (bonus parent) and your mother/father, to help make this the very best family it can be? It can also be a very meaningful part of your blended families wedding vows to have a sand ceremony in which the bride and groom plus any children each have a container of different colored sand. This ceremony is safer than having them all participate in a Unity Candle one considering the ages of the child/children and how mature you deem them to be. You could have a mother and daughter, for instance, both have sand in shades of pink, possibly fuscia for the mom and soft pink for the child. Conversely, the father and son could have bright blue for the adult and lighter blue for the son. These are just examples, but you get the picture. Alternatively, you could have every one have an entirely different color and then have them all pour the containers into the central one as the minister reads the words pertaining to it. Then the children could step back to their places (assuming that they are part of the wedding party) and the bride and groom go back to theirs. The minister would then go back to the regular ceremony and finish with it. As you can see, it is not so difficult to have wonderful blended families wedding vows in your ceremony. Go from "Blended Families" to "Home Page"